The M1 MISTRAL is the economical choice for rapid analysis of bulk materials and coatings, guaranteeing accuracy when delivering information on the elemental composition of materials. Features include spot sizes down to 100 µm. Much like detailed items of jewelry, samples with suitable shapes can forego additional preparation, be analyzed instantly, and above all, non-destructively. 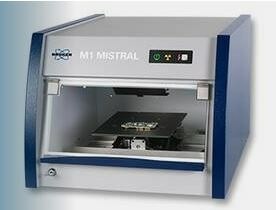 The M1 MISTRAL can accommodate sample sizes right down to 100x100x100 mm3. The user can achieve precise pinpointing of their required measurement location using a video a video microscope with cross hair-functionality. Fast focusing is enabled by a motorized Z-stage, and an X-Y-Z stage is available as an add-on, which offers additional ease. The instrument can accommodate sample sizes right up to 100x100x100 mm3. A high brightness micro-focus X-ray tube guarantees exceptional excitation of the measurement spot and thus a high fluorescence yield. The XSpect software suite enables accurate quantification results when analyzing extremely complex multi-layer structures and bulk materials alike.